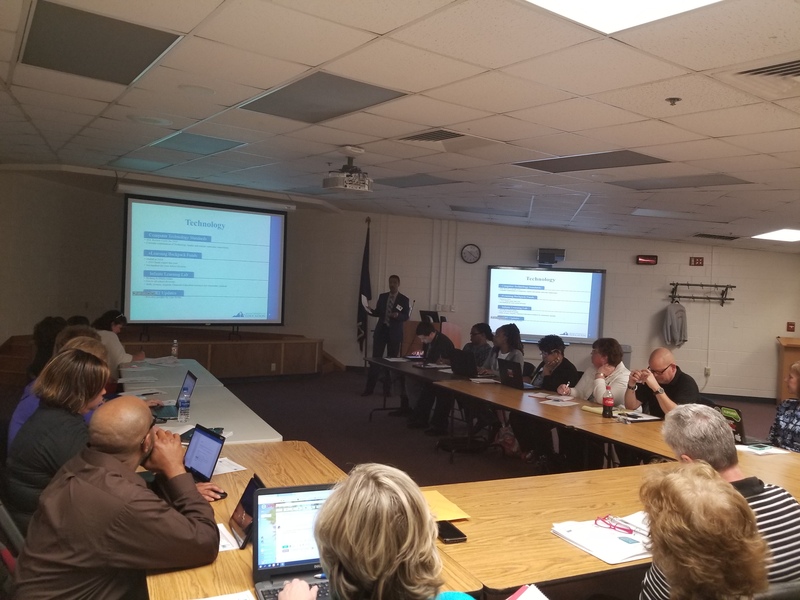 Mark Saunders, VDOE, speaks with SVRTC members about updates on technology and computer science standards. The SVRTC was well represented with eighteen school divisions (Amelia, Appomattox, Brunswick, Buckingham, Charlotte, Colonial Heights, Cumberland, Danville, Dinwiddie, Franklin City, Greensville, Halifax, Lunenburg, Mecklenburg, Nottoway, Petersburg, Prince Edward, Sussex) present at the April 18, 2018 SVRTC meeting. Members welcomed Mark Saunders, Director of Technology and Virtual Learning, with the Virginia Department of Education (VDOE). Mr. Saunders’ presentation included information on the state technology plan, Intel Tech Online Courses, Open Education Resources, Computer Technology Standards and the eLearning Backpack Funds. Lauren Mathena, Director of Economic Development and Community Engagement, with Mid-Atlantic Broadband Communities Corporation (MBC) also addressed the members. She educated members about MBC’s initiatives with the FIRST Robotics program in a Powerpoint presentation. Lauren explained how MBC supports the FIRST Robotics program and emphasized what an important component the FIRST Robotics program is for our area for enhancing workforce development starting at the secondary school level.